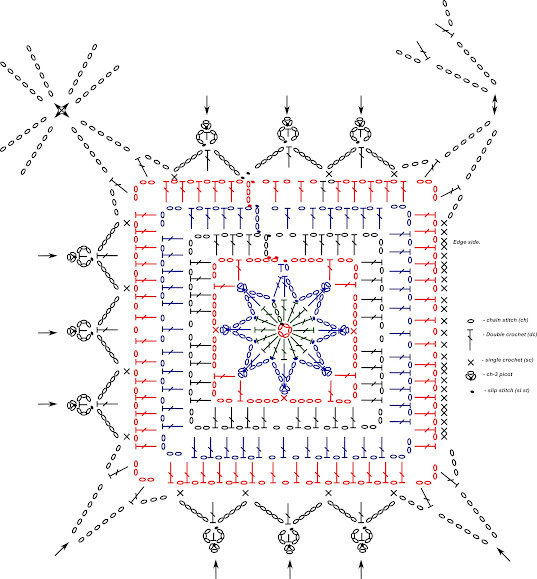 Outstanding Crochet: Free notes and charts for crochet long vest. Summer is in full spin and I am going to travel for a month. I am not sure how often I will post if at all. I wish you have a great summer, not so many projects done :), because it's time to drop our hooks and get out of the house for new adventures. I am going to Russia to see my family. I've been sending my charts and notes for this vest from Boston Proper for a while, as many of you might know. I want to go further and post the charts here. This is not a pattern, just notes I made for myself in the process. There is a lot to figure out by yourself. I am sorry if it turns out to be difficult for some. Size Medium/Large (36-38'', 92-97 cm in bust circumference) . Size 5 cotton thread, 49.6 г - 210 м, 1.75 oz - 230 yards, crochet hook 2 mm. Gauge - square motif side is 16 cm. Connect squares as you go by p, but not by ch-12 sp at the corners. Only when you have 3 squares,connected by p, make 4th square and make connection where 4 corners meet (instead of ch-12): ch 6, insert hook in 3 ch-12 sps of other 3 squares (counting them counterclockwise), yarn over (yo), draw yarn through 3 ch-12 spaces, [yo, draw yarn through 1 loop on hook] twice, ch 5. Each front part is 1 3/4 squares wide, the rest is back. 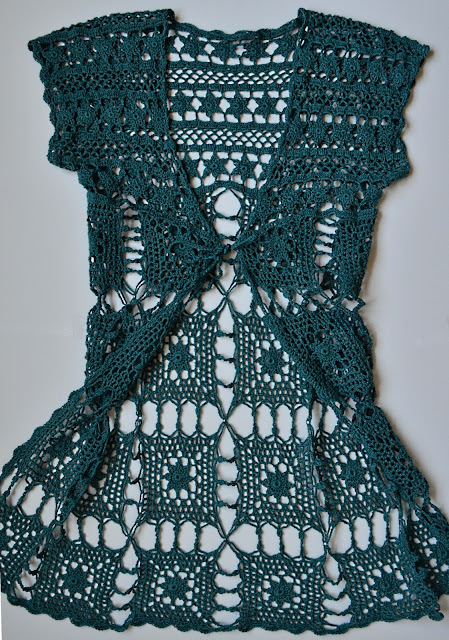 Upper part of vest: crochet up from the bottom. Right front part: work on 62 stitches. Connect in every 6th dc. The last star is missing one beam, to decrease. Connect 3rd beam of this last star by tr to the last dc. 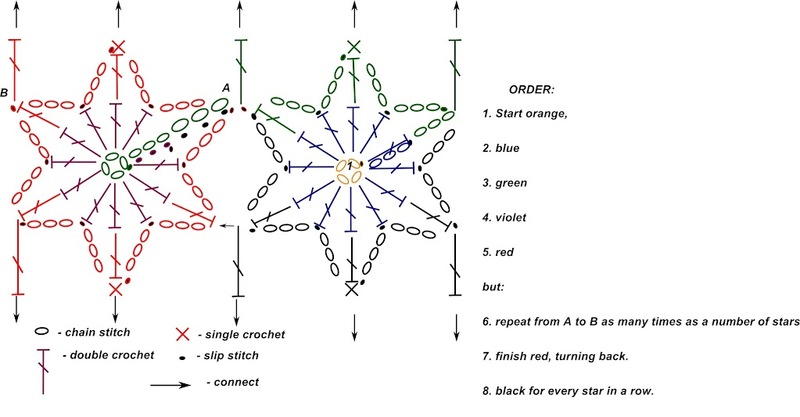 ROW 3: Ch 5, instead of every 6th ch make 1 dc and connect 2 beams of neighboring stars at the same time = (55 stitches above 5 stars) plus ch 12 for a sleeve. ROW 5: net: ch 5, sc in every 4th dc, except first sp (connect first sp in 2nd dc - to make smooth decrease) = 17 spaces. ROW 9: 5 stars, connect last one at the neck line in 8th dc from the edge by tr. ROW 12: net, 1st ch-5 sp at the neck line in 3rd dc from the edge, the rest in every 4th. ROW 14: ch-5 net, do not decrease. Left front part: the same as right. Row 3: 145 dc . We need 61 dc for every shoulder + 46 for the neck hole = 170 dc. So, increase 25 sts from 4th to 16th rows at some points. ROW 18: ch-5 net, connect with front next 5 arcs from the edge. ROW 19: ch-5 net, connect the rest of shoulders. 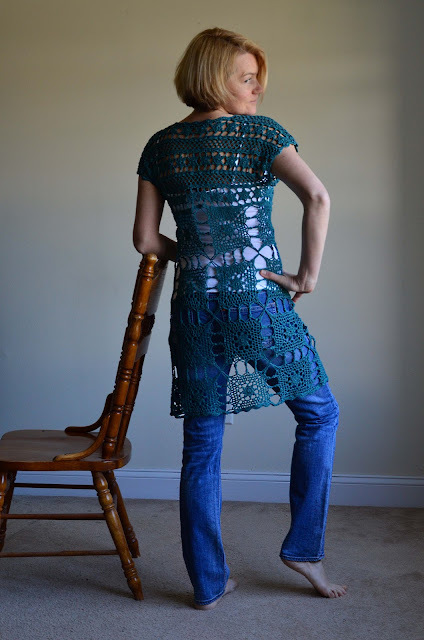 Absolutely beautiful long crochet vest! Love it! Wow, you're pretty good at crocheting! I would immediately get lost hehe :) very nice cardigan!! Beautiful! What software do you use to make your charts? I use free software Inkscape. Nekem meg is van! Amit nagyon szépen köszönök Neked itt is. There is no chance. :)))) Sorry! I might make a proper pattern, but cant say when. You're the best! Have a great vacation with your family! Какой красивый жилет! Спасибо за схемы. Я заказала такой жилет тете. Жду))) Сама просто не успела бы к 1 сентября. Я ведь в школе работаю. Но я не такая худенькая, как Вы, Наталья. Всегда любуюсь Вашими фотографиями. Спасибо, Виктория! О чем Вы говорите, Вы в прекрасной форме и вообще это не важно. Буду ждать фотографий! I recently came across your beautiful work. I love to crochet and have several wip's to finish, but I love this and may just have the thread for it! Something that I have been saving, so I am excited to finally choose something and of course, now I want to start on it and just drop everything else! Thanks so much for sharing your notes and pictures. Hope your vacation was wonderful and look forward to seeing more of the works you share. I really enjoy them! Hi Melika! Thank you for your comment! I wrote the notes a long time ago when I did not know Crochet language that well. I made corrections. Unfortunately, I won't make more clear instructions because it's not my pattern. Hi, I would love a copy of your pattern. Please email to imazur007@gmail.com. I'll be very grateful if you could kindly e mail the written pattern to my id shobacd@gmail.com. Thank you. just found this on pinterest and I love it. 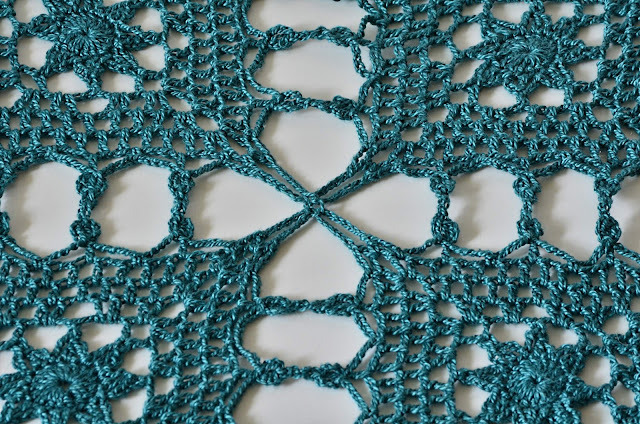 I'm still learning to crochet so would you say this is a difficult pattern? I' would like to try it but I've never used a chart before, ive only used written pattern and that was for a bag. ive not made anything to wear before. thank you for posting this. This is a DIFFICULT pattern. 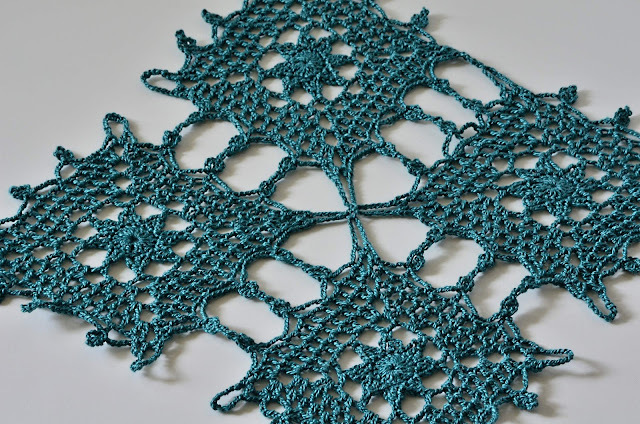 You have to figure a lot of it out for yourself and many of the terms she uses aren't really English crochet terms, just the best how she could explain. 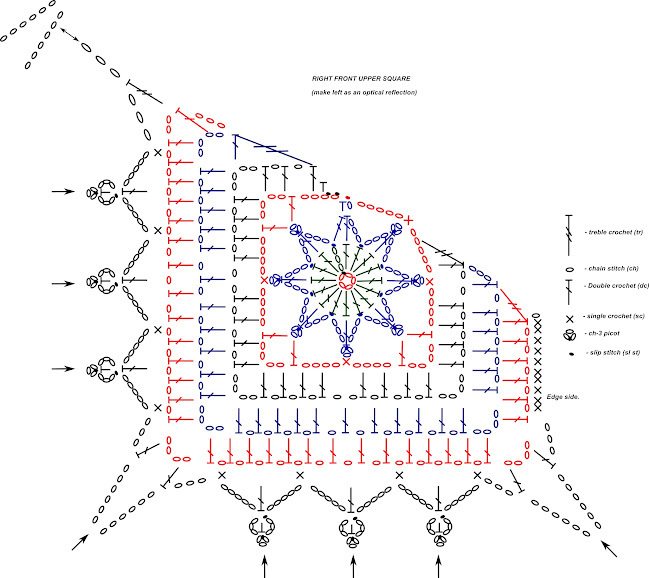 Until you're able to read European and Russian patterns, don't even try something like this. You'll just end up frustrated. I did and I had a tangled mess of yarn when I first started. It's still difficult but not impossible. Just keep learning! Suzanne2, if you are not familiar with charts, I wouldn't suggest trying it. It's not a pattern. 3 charts to figure and count the rest of it by yourself. Beautiful! 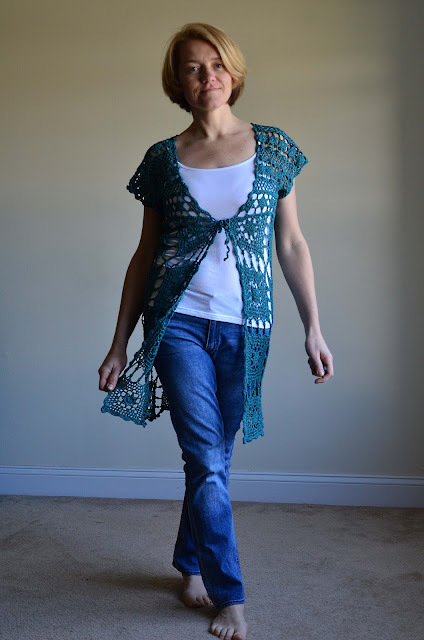 You need to check that this shop https://www.etsy.com/ch-en/listing/262460646/crochet-lace-cardigan-pattern-crochet?ref=shop_home_active_10 is not reselling your free pattern. Ask for screen shots for example - I'm sure you will be able to recognize your free charts. Seven her patterns are FREE charts created by styleknitting.ru (like this one http://crochetpatternstotry.blogspot.com/2015/07/free-chochet-pattern-for-joie-elida.html?spref=pi ) and in her sold items you might see Drops design free pattern http://www.garnstudio.com/pattern.php?id=6886&cid=19 . So it is possible that she uses your free pattern for this vest as well. Good luck! Thank you! I sent her a warning and will take actions if she doesn't remove this listing by tomorrow. When I got your message, I checked the listing, but I did not what was inside, so I couldn't do anything. Today somebody sent me screenshots of the listing. There are my charts and my horrible notes! This can not be called "a pattern" by any means and it's illegal. Some people bought the "pattern", then found my notes here and felt robbed by this dishonest person! Thank you for reaching out to me! You do amazing crochet work. Thank you for all your inspiration. Natalia I have a quick question for you. Where did you start on this on the top or the bottom? I would love to make this, but any advice would be more than welcome. I also wanted to say when I found this I absolutely fell in love with it and you did an absolutely stunning job it is so gorgeous!! HI! I made squares first, then made top of the vest from squares top edge up. This is a lovely vest, yes! Good luck! Спасибо! Мария, у меня нет описания на русском. :( и к сожалению нет времени заниматься этим жилетом. Я разместила здесь мои какие то записи, это не схема, это не мой дезайн, так что я не считаю себя вправе делать подробную схему, да и нет времени на это. Я извиняюсь, к сожалению это все что я могу предложить. Удачи! This is beautiful! I'm having a hard time finding the yarn. Can you make any recommendations? hi i am in the united kingdom and I'm having trouble find the yarn but I have found it in america. only problem is i am not clear on how much i will need, i love this vest and really want to make it. can anyone help please. I can't tell you right now, I am away from home, but I will have 400 g for size M-L.
hi thank you that will be fine. what do you mean by connect by p.
Connecting picot: ch, sc in adjacent p or another st, ch, sl st in 1st ch. Hi there! I speak English and Russian. Thank you for sharing! You've done a tremendous work! Love your vest! 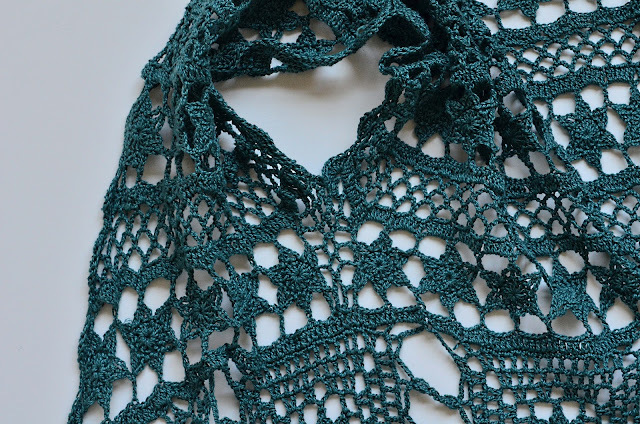 Do you have a tutorial on this beautiful pattern, I dont know how to read patterns and have never attempted to make clothing before and would feel more comfortable with a tutorial. You can check my patterns by pressing "check out my patterns Shop" button below the header. I don't have this particular pattern though. Hi Natalie. Thank you for sharing this with us. Would it be possible to send the pattern to me on ernameintjes@gmail.com. When working the upper part of the vest, your notes refer to ch-5 net, ch-5 net 2/3 or 1/3. What does net stand for. Thank you for sharing your notes. I cannot find the link to the full pattern that you refer to. Could you please send the full pattern to rach_on@hotmail.com please? If you don't have the pattern, which I'm confused about by all the replies, it would be better not to post this beautiful vest I would love to make my niece. Thank you. Please send some sort of reply. Thank you.